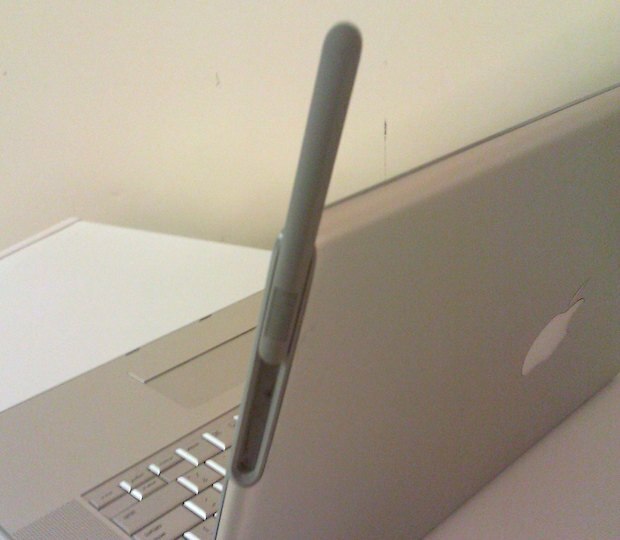 A prototype MacBook Pro 15″ with a built-in 3G cellular modem has shown up for sale on eBay. Other than a 3G antenna and SIM card slot, the 2007 model is mostly an ordinary MacBook Pro with a Core 2 Duo chip, although there’s some additional soldering and the motherboard is red which is typical of Apple prototypes, according to MacRumors, who found the prototype. As you can see in the picture, the antenna sticks out the top of the MacBook Pro’s lid, which isn’t the most glamorous solution, and considering Apple’s obsession with design this is probably one of several reasons the prototype never saw mass production. It’s also fascinating that despite the 3G modem not working, curious buyers are bidding the four year old MacBook Pro well beyond its resale value. By far the most interesting part of this prototype is that it demonstrates how serious Apple was (is?) about including native cellular connectivity in Macs, even four years ago. The question for today is if a built-in 3G or 4G modem really matters anymore. Personal Hotspot in iOS 4.3 and up allows Mac users to share an iPhones internet connection, so having yet another cellular data plan for a Mac seems somewhat unnecessary. All that said, Apple has recently solicited feedback from MacBook Air owners about 3G connectivity and usage, and has also patented antenna designs that show a 3G enabled Mac laptop, suggesting that Macs with their very own data plans may still be coming to market sometime in the future. AT&T and Verizon need to start offering universal device data plans – one data plan works on ALL of your devices, otherwise we’re going to have a different data plan for each device which is just stupid. I already have one for my iPad and iPhone, and because they are separate bills I would rather have the WiFi iPad so that I could just tether it to the iPhones data. Why pay twice? But then these carriers are charging us for tethering too, so you’re damned either way it seems. Another data plan for a Mac? No, I will just tether, but I like the idea if the greedy carriers could stop trying to gouge everyone. LOL oh man that is so ugly, not Apple at all, no wonder it never left the Bat Cave. I really don’t think that’s actually an apple prototype. Even as a prototype I don’t think they would make it that ugly, it’s easier to start off with a vision and work towards that rather than just make it up as you go along hoping you can think up a solution to look better. Looks shoop’d. I can tell from some of the pixels, and from seeing quite a few shoops in my time. Personal Hotspot in iOS 4.3 and up allows iPad users to share an iPhones internet connection, so having yet another cellular data plan for an iPad seems somewhat unnecessary.